Epicentro - "Senza Scuorno, Senza Paura" / "A Fine D'a Streppegna"
From Naples, Italy, Epicentro plays complex, fiery instrumental rock that brings the power trio concept to it's knees. On both CD's the band consists of Giacomo Ciavatta on guitar and bass, Carmine Vesuvio on drums and percussion, and Luigi Salerno on double-bass. Senza Scuorno, Senza Paura opens and closes with a short pastoral piece that includes harpsichord sounding keyboards, bowed bass, and angelic choir. 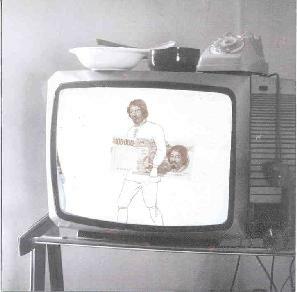 But from "Tammorriata" on we're blasted with what is, at it's core, heavy rock, but the arrangements have a complexity that catapults the music into the outer limits of exciting progressive rock á la mid-70's King Crimson, Cheer Accident, and, at times, Glenn Phillips and even MX-80 Sound. Quite a variety to be sure. The music has a metallic edge though to call it prog metal would not be doing it justice. The arrangements are far more exciting than that label would imply, being more like a Zappa form of metal if that analogy makes any sense. "Pullecenella 'n' Croce" opens with fiery jazzy bass runs that are soon joined by bowed strings and a dramatic percussion buildup. Ciavatta's guitar cranks out molten chords and riffs that dispense with flash in favor of solid composition and arrangement. "Menadi Danzanti" is even more complex heavy metallic rock with hints of jazz. This is well thought out music that doesn't let the listener off guard for a moment. It's continually shifting rhythmic gears and the intensity level is high at all times. My two favorite tracks are "Trupea 'e Calore" and the title track. "Trupea 'e Calore" has some of the riffs that reminded me of King Crimson's "Red". Imagine "Red" being a bit jazzier. But this is also one of the tracks that reminded me of MX-80 Sound. Not the punkier side of that band but in the heavily layered chainsaw guitar sound that band was noted for. But in the song's 11-minute length it segues through a number of themes, some of which are heavily influenced by classic Italian progressive rock. And despite the King Crimson and MX-80 analogies this also has some of the quieter moments on the disc, including acoustic guitar and lounge jazz bass lines. A powerful track that illustrates how potently this band is able to make its statement when they take the opportunity to stretch out. 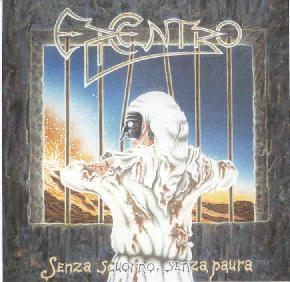 "Senza Scuorno, Senza Paura" is the most overtly metallic song on the disc. But for this listener this is what metal should be about as the arrangements are as intricate as any of the other tracks. A Fine D'a Streppegna is a little different effort. On the one hand it rocks even harder as the metal heard on Senza Scuorno, Senza Paura becomes almost punkish here, though the sense of development as the song progresses is no less apparent than before. But there are also a number of acoustic passages that feature the lighter side of the band. Epicenter also utilizes samples in the form of seemingly non-stop voicings that may well be telling a story (it's in Italian). I knew I was in for a change right from the beginning as "O Buvero" launched into another heavy Crimsoid jam that soon became even more frantic and intense than the previous disc. The MX-80 analogy is even more conspicuous here and the drums kick out an even rock 'n roll pace. "La Vendemmia Di Euterpe" goes in the opposite direction being a peaceful classical acoustic piece that is both Medieval and modern classical. But from "Per Sole 100000 Lire" on things start to get difficult. I was reminded in ways of an "Italian Revolution #9". The voices and various other sounds aren't just a part of the music... they continually interrupt, and even replace, the music and made it difficult for me to keep focused. But there are some impressive moments. "L'anagramma Di Giubileo" is a rocker with dual guitar parts that venture a bit into psychedelia, a steady thudding bass line, and the most varied drumming I've heard on either of these discs. The drumming is even more striking on "Anema, Core E Cazzimma", a good tune that is reminiscent of the passion heard on the first disc, only this one mixes in acoustic passages that the band integrates perfectly with the heavier parts. And finally, "Pithecusa" is very much like a track off Senza Scuorno, Senza Paura, but is more of a driving rocker. Complex rockin' metal that blazes along for 10 minutes of crunchy, and often lightning speed, rock. In summary, A Fine D'a Streppegna seems a little uneven compared to Senza Scuorno, Senza Paura. Close listening reveals some of the most intricate instrumentals on either disc, particularly from Vesuvio's drums. But all the voice samples really got in the way of what would have been really thrilling instrumentals. In fairness though, it may well be that there's a story going on that I'm unable to catch due to not speaking Italian. Still, I'm glad to have heard this different side of the band and I think anyone checking out the band would benefit from both discs, though Senza Scuorno, Senza Paura is definitely the place to start. The only problem with these CD's is that at the time the band sent them to me they were not yet being distributed. But this is really wonderful music and if you are intrigued by this review I'd advise you to contact the band expressing your interest in hearing them. Epicentro have a web site at http://www.egs41.it, but the last time I looked there was only a main page with no links to information. You can email the band at epicentro@tiscalinet.it. Contact via snail mail c/o Giacomo Ciavatta; Via Epomeo; 180 80126; Napoli, Italy.